We always use February as "Old Toys Month" - what better way to honor that than with the oldest action figure there is? GI Joe (a.k.a. Joseph B. Colton) graduated in 1960 from the United States Military Academy at West Point, receiving the academy's highest possible honors. An expert marksman, he quickly became proficient with all modern weaponry - from M60 machine guns to attack helicopters and L.A.W. 's (Light Armored Weapons.) Recruited by Special Forces, Colton was destined for military glory, quickly distinguishing himself as an outstanding Green Beret. In 1963, after participating in "ultra" top secret combat operations and extensive tours of duty in trouble spots around the world, 1st Lt. Joseph B. Colton became the most decorated - and most feared - battlefield soldier the world has ever known. Recognizing Colton's innate combat skills and his warrior heart pumping courage through his veins, then President, John F. Kennedy secretly selected him to create an ultimate freedom fighting force. Higher ranking soldiers had been passed over for this elite, presidential appointment. Colton was issued the code name "GI Joe", and began building his team with the toughest men the armed services could muster. From there, GI Joe would change the course of military history and redefine the word hero! Wow, what a long bio! Of course, he deserves it: this is the guy, the real deal. Okay, clearly he's not the real real deal, since the original GI Joe dolls were 12" tall and this is only 3⅞", but still. 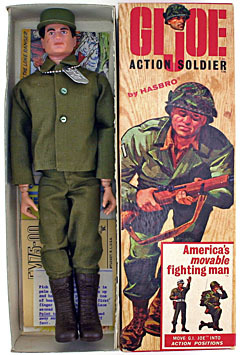 In 1964, Hasbro created the world's first "action figure" as a way to sell something other than balls and toy cars to boys. America's Movable Fighting Man was a huge hit, and an entire industry was born. Of course, that was completely unrelated to the Real American Heroes we got in the '80s - those Joes were entirely separate... at least until 1989, when Larry Hama introduced Joe Colton to the modern world. In 1993, Hasbro followed suit. This figure's head is clearly based on the original toy, right down to the (literally) trademark scar. The sculptors had done faces based on real people before, so copying an older toy isn't that wild. We're not sure who designed the original toy's head - Sam Speers is credited for the design of the figure, but does that mean its looks, or just its engineering? 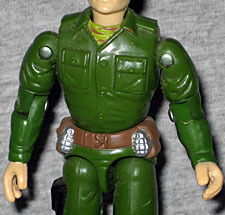 GI Joe gets a completely new body - it wasn't shared with any other ARAH figures. He's wearing brown boots, green pants with a holster sculpted on the right leg, and a long-sleeved green shirt over what is either a camouflage T-shirt or scarf. He has a brown belt with two large pouches on each hip and a matched pair of silver grenades hanging near the front. It's very weird to go back and look at this Generation 1 styling, now that we've gotten so accustomed to the detailing present in G3: the sculpt tries its best to pack in a lot of detail, but everything just ends up looking soft, and the proportions are screwy. He's not that much shorter than a modern figure, but everything is "squashed," for lack of a better term. 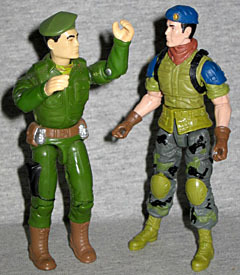 Since all the G1 figures shared the same buck, GI Joe moves just like everyone else. He has hinged knees, balljointed hips, an O-ring waist, hinged elbows, "swivel arm battle grip", swivel/hinge shoulders, and a balljointed neck. Man, remember when figures didn't have wrists or ankles? The particular pose of his right hand seems to be a reference to the original 12" figure, but sadly molding technology wasn't advanced enough in 1993 to give him the trademark upside down thumb. And just like with the scar on his cheek, when we say "trademark," we're speaking literally: Hasbro couldn't copyright or trademark the human body, but they could claim those specific deviations from the norm. 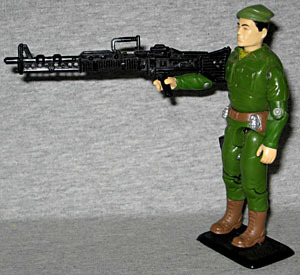 GI Joe comes with one accessory: an M-60 machine gun. It's a copy of the piece originally included with 1992's Gung-Ho, and is ridiculously oversized. Seriously, this thing is sized for a 6" figure, not a 3¾" one. He can hold it, though, so that counts for something. He's also of the vintage where Joes came with flat, textured display stands with a single footpeg; good thing, too, since that's the only way he'll stand with his gun in his hand. Joe Colton was available only from the "Top Secret" special mailaway in 1993 - you sent in 5 UPCs and $1 and you got this exclusive figure in return. If you sent in 20 UPCs, you could get an anniversary 12"er to go along with it. Of course, the figure shown in the brochure had some definite differences from the one you eventually got in the mail: the body was the same, but the head was different and he came with a small M-16 that was better sized for him to hold. Oh, also his grenades were gold. The figure actually shipped in 1994, right in time for the character's 30th anniversary. He had a G2 version in a 2004, so by that logic, we'll get a G3 version in 2014. 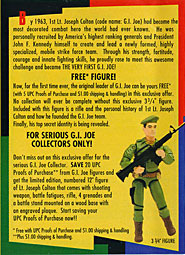 So you can either wait two years for GI Joe's 50th anniversary, or you can track down this version now.